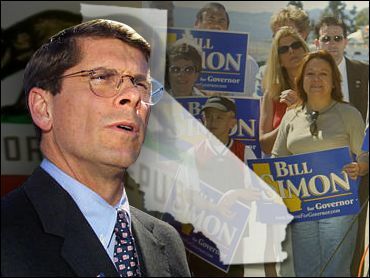 Conservative political novice Bill Simon won Tuesday's Republican gubernatorial primary, defeating one of California's best-known politicians in a spectacular upset aided by Democratic party meddling. A low turnout that attracted mainly fellow conservatives helped Simon defeat former Los Angeles Mayor Richard Riordan, a moderate who argued that only a centrist could beat incumbent Democratic governor Gray Davis in November. Davis, who easily won renomination in his own own party's primary, poured $10 million in attack ads against Riordan in the weeks leading up to the Republican primary. It was an unprecedented interference in another party's primary by a seemingly mild-mannered governor often criticized for playing politics with all the cunning of a cobra about to strike. Davis, running nearly unopposed, easily won the Democratic nomination and signaled Tuesday the direction he'll take against Simon. "I respect the sincerity of his beliefs but I believe many of his ideas are out of step and out of touch with most Californians," Davis said in a victory speech. "We need to keep moving California forward, not backward, and certainly not to the right." California's primary kicked off the voting in a midterm election year in which the parties will be contesting 36 governorships and fighting for control of the closely divided Senate and House. With 99 percent of precincts reporting, Simon had 49 percent, or 1,010,915 votes, and Riordan had 31 percent, or 642,864 votes. Secretary of State Bill Jones had 17 percent, or 347,929 votes. The estimated 36 percent turnout was the second-lowest in state history. The defeat was a stunning collapse for Riordan, who once led by more than 30 percentage points in polls. Simon vowed a strong fight against Davis, accusing him of failing to improve public education and bungling the state's power crisis. "The Democrats have tried to divide us. They say that California is a one-party state," Simon said in accepting the nomination. "But as Mark Twain once said, the rumors of the demise of the California GOP are greatly exaggerated." In his concession speech, Riordan urged Republicans to unite behind Simon but repeated his campaign theme that the party must become more inclusive of minorities and women. "My campaign carried a message worth fighting for," he told supporters. Confident of victory in the campaign's early days, Riordan, 71, largely ignored the conservative voters who make up the Republican Party's base. That gave an opening to Simon, a 50-year-old investor with conservative views and a GOP pedigree. His father, William E. Simon Sr., was treasury secretary under Presidents Nixon and Ford. 27 Senators were in Congress for Clinton's impeachment. What would they do about Trump? Former Vice President Joe Biden officially entered the 2020 Democratic primary Thursday. Democratic strategist and former Hillary for America aide Joel Payne speaks to CBSN's Reena Ninan about Biden's rollout and how he fits into the crowded race.